It’s coming up on our 5-year MACS-versary, and it’s time to get cheesy! As gratitude bubbles out of us, let’s all take a hot minute to reflect on how this thing got started. 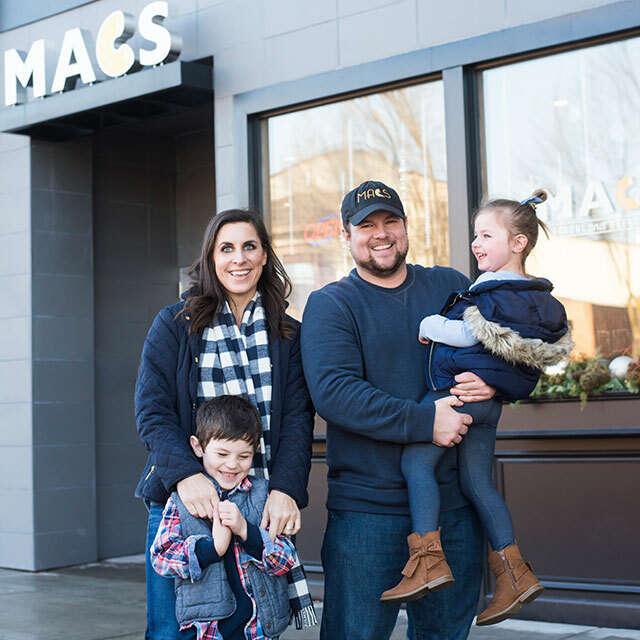 Since MACS owners Nick and Jackie Morse both grew up in the family restaurant business, it was almost inevitable that they’d open their own – but what would it be? When they talked about possibilities, it was often over their son’s go-to meal – boxed macaroni and cheese. As Nick recalls, “We thought, hey – we could keep cooking it out of a box, or we could hit that mac and cheese with a little more creativity – and then we could create a restaurant around that mission.” Could a cheese and noodle-focused concept be a 5-star hit? It was time to find out. For months, Nick and Jackie worked into the early morning hours ­– concocting what eventually became the Mac and Cheese Shop menu. The endlessly messy kitchen and flavor experiments? They paid off. Still, you’ll thank us that some of the more out-there tryouts didn’t make the culinary cut. Fan favorites like our Chicken Bacon Ranch MAC (plus personal favorites like Hangover MAC and Popeye MAC) prevailed. MACS was coming closer and closer to reality. 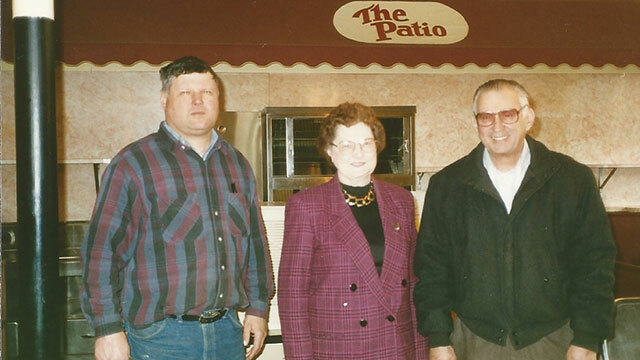 Outside of the old restaurant in Wisconsin Dells – the Patio. A location opening up in one of the family’s beloved hometown Wisconsin Dells buildings sealed the deal. 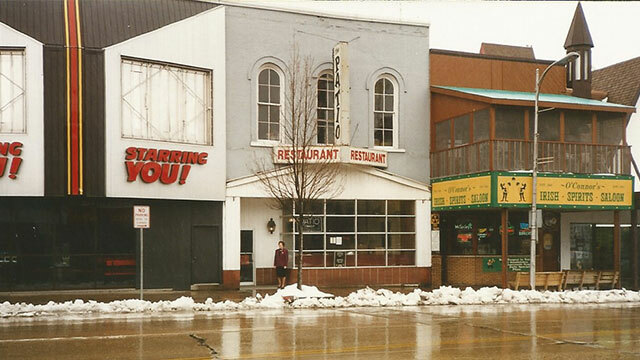 Jackie’s grandparents owned a restaurant where the very first Macaroni and Cheese Shop now resides, and that space will forever be a cornerstone of the MACS brand. In the five years since, we’ve been mac-and-cheesin’ what feels like every corner of Wisconsin. Jackie’s Uncle John, Grandma Katherine and Grandpa Robert. We recently opened our Green Bay, WI location, with Brookfield and Oak Creek shops coming up hot. And in all of our soon-to-be seven locations, we’ve got that down-home, mom’s-making-something-EXTRA-delicious feel. That’s probably thanks to Jackie’s rustic modern design, the portraits of the people and food we love most – and our ‘Ode to Wisconsin Cheese’ murals don’t hurt, either. MACS started five years ago with Wisconsin cheese, a family sauce recipe, traditional cooking techniques and the idea that other families might like top-quality, handmade macaroni and cheese as much as we do. Travel Channel’s ‘Food Paradise’, Fox Cities Magazine’s Golden Fork Awards—and all of you—seem to agree. For that, we are all sincerely thankful. We’re thinking a celebration’s probably in order, and for a craving like this? It can only be satisfied with MACS! Nick and Jackie with the kids in front of their Wisconsin Dells shop. © 2019 MACS, Macaroni & Cheese Shop. All Rights Reserved.